Yu Garden, located in the center of the Old City next to the Chenghuangmiao in Shanghai, China, is considered one of the most lavish and finest Chinese gardens in the region. 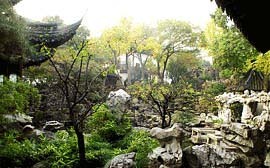 The garden was reportedly first established in 1559 as a private garden created by Pan Yunduan, who spent almost 20 years building a garden to please his father Pan En, a high-ranking official in the Ming Dynasty, during his father's old age. Over the years, the gardens fell into disrepair until about 1760 when bought by merchants, then suffered extensive damage in the 19th century. In 1842, during the Opium Wars, the British army occupied the Town God Temple for five days. During the Taiping Rebellion the gardens were occupied by imperial troops, and damaged again by the Japanese in 1942. They were repaired by the Shanghai government from 1956-1961, opened to the public in 1961, and declared a national monument in 1982.